Kazakhstan Part 3, with a bit on the side. Almata, Kazakhstan. 22nd July 2014. I was up and about quite early on the day I left Almati but still didn’t manage to leave the hostel until after 11am. It must be true about parting being such sweet sorrow or maybe I just struggle to get my backside into gear. Either way, having drawn me a map of how to escape the city Nurlan then got in his car and led me out onto the road I needed. Such kindness. Leaving Almati and Hostel Athletic. 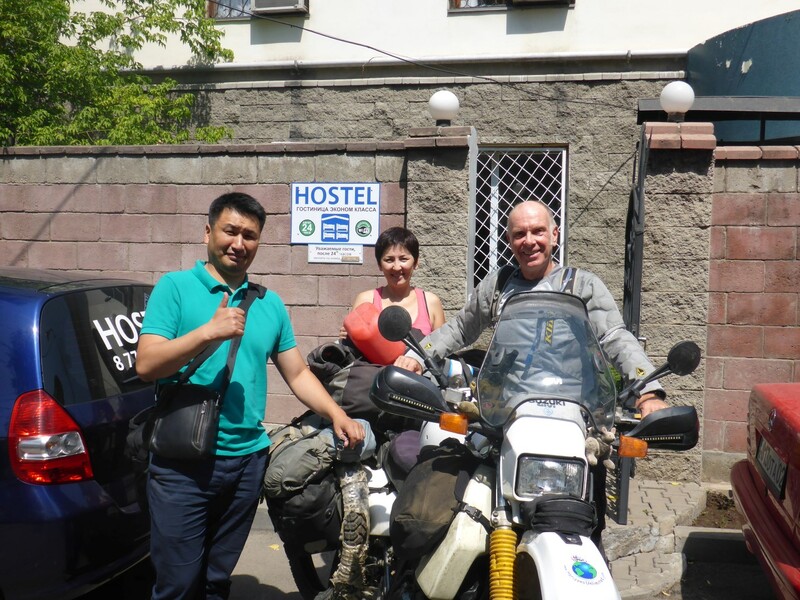 My journey plan was to visit some of Kazakhstan’s areas of natural beauty as I rode generally northwards to eventually reach the capital city, Astana. 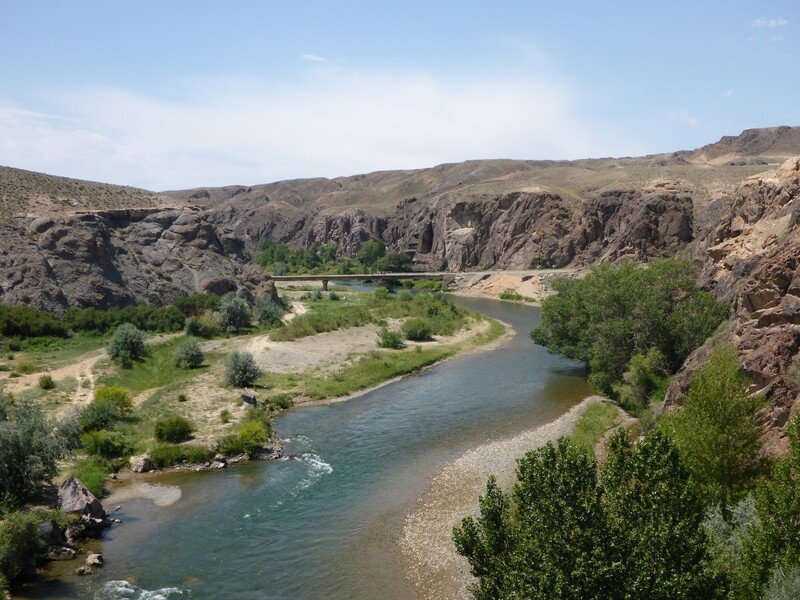 The first place on my list was the Charinski Canyon, an area of watery greenness among the barren Kazakh landscape. As I rode away from Almati I was surprised how quickly living standards appeared to drop. The cars became older, the trucks older still and there were many horse and donkey drawn carts. I stopped to buy some fruit and then in a shop I spotted some peach flavoured ice tea in the fridge. I’d been drinking coke as well as water up to that point so I thought I’d give it a try. It was a delicious revelation! This ‘milk but no suger’ tea drinker had always thought iced tea was a bit of a weird drink. No longer. No more coke, iced tea, preferably peach flavoured was definitely The Real Thing. Another great roadside statue. I’ve no idea who he is though. The terrain was changing once more with barren hills either side of me. 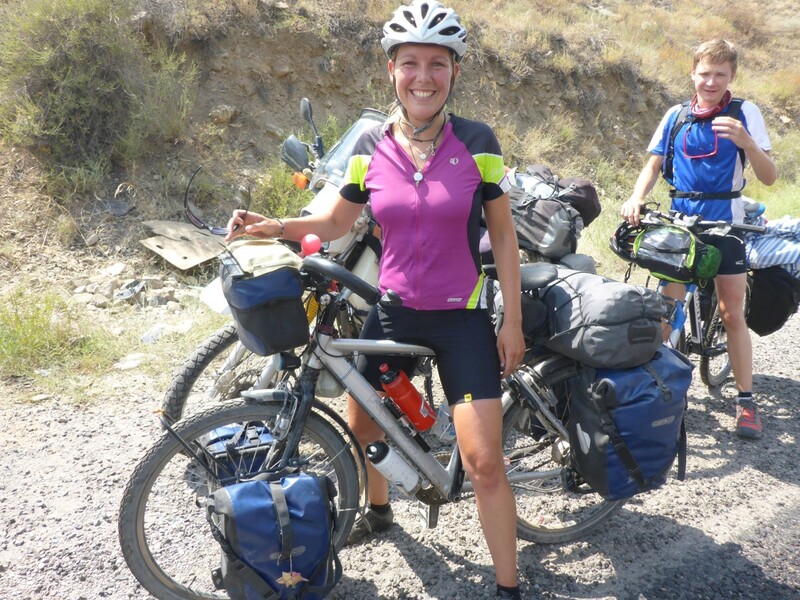 Eventually I came to the Kokpek Gorge, a nice, steep, twisty climb which I could enjoy riding. After a few kms of this who should I come across but the two Dutch cyclists I’d met on the way to Almati. We were delighted to see each other again. They’d been in Almati too and were also en route to the Charinski Canyon. This time I made sure I got their names and also Hera’s phone numbers. The plan was for me to go ahead, find the canyon, scout out a good camping place and text Hera the details. Simple really. We were all really looking forward to enjoying an evening together sharing experiences. I didn’t see them again during all the rest of my time in Kazakhstan. So what went wrong? Two things. Firstly there was a junction further along and I went left, guided by the coordinates for the canyon I’d got from the internet and put into my GPS. They had a better map than me and it led them to go, correctly, straight ahead. Secondly, despite having four phones between us, Hera and I couldn’t communicate so no way of checking in with each other. I spent the rest of the afternoon and evening trying to find the canyon and them, and eventually, it having got dark, pulled off the road and camped out under the stars just with my sleeping mat and bag. Needless to say it rained. And I was near a steep hill in full hearing of the trucks grinding their way up and down it. 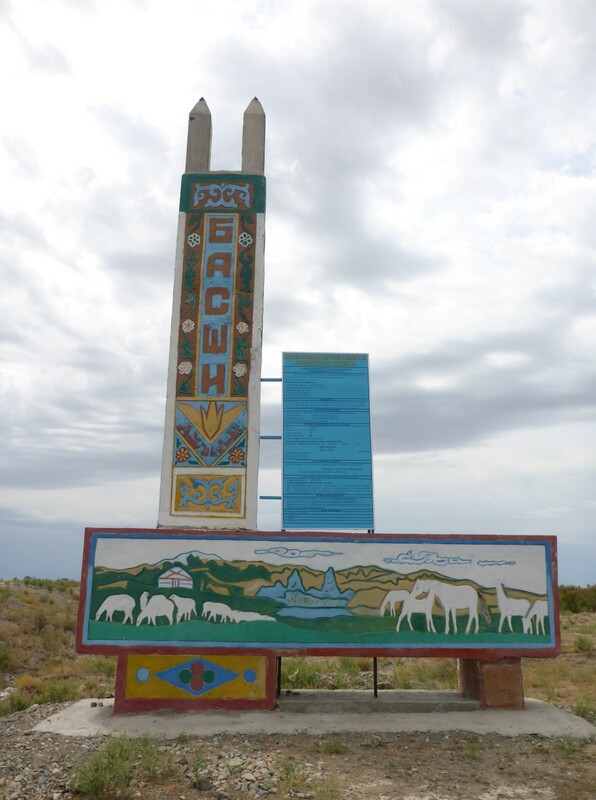 Kazakhs do seem to like a roadside statue. This was were I spent the nigth. I got up with the sun and got on with my ride as fed up and as tired as it’s possible to be. I was hoping I might be able to contact Hera at a later date, either by phone or through her website. In the meantime I had to get on with my own journey so I carried on northwards towards Altinemil National Park.I’d managed to find a nice café for some Borsch and coffee so was feeling better. Information board for the Altinemil Nationa Park. Not for very long though. I was riding through some roadworks, down a twisty hill when I got stopped by the police. I pulled over. No niceties this time, no handshake or comments on the weather. All he said was ‘Sixty five KPH, speed limit fifty KPH’. This was the real thing, the only question being ‘How much was it going to cost me?’ I got my documents and got in the car. He checked everything and then wrote down a figure of $50 on a piece of paper. ‘No dollars’ I said to him. So he wrote down a figure of 10,000 Tienge (about the same amount). I told him that was way too much, I wasn’t going to give him anything and I would suffer the fine. He still had my driving licence and said he would have to sent it off to Astana with the paperwork and the fine would be T18,250. I was stymied now. He was pointing to my wallet so I pulled out T4,000 and gave it to him and he gave me back my licence. At that point my anger welled up and I grabbed one of the two notes I’d given him back out of his hand and told him he was nothing but a thief. I should have grabbed them both. Was I speeding? Probably and I could have asked to see the photo on the camera. But in the end it cost me the equivalent of £6.60. What angered me more than anything is that these speed traps are just there for the police to make money, nothing more. And then the day got worse. Not much further down the road I heard a clicking noise as if something was knocking against one of the spokes. I stopped to check but couldn’t see anything. The noise was still there and I thought it might be a stone trapped behind the chain guard. So I pulled up, took it off and checked again. While I was doing so a Kazakh guy on a KTM stopped to see if he could help. He told me he owned the KTM dealership that I’d seen in Almati. I said I thought I was OK and went on to tell him the story of the police. He told me that under Kazakh law the police have to produce a photo of the front number plate to get a prosecution. Bikes don’t have one so I should have stood my ground and refused to pay. Well that’s easy to do if you can have that argument in the local language but not so easy otherwise. Still, I thought I’d give it a go if I got stopped again. In fact, at that moment, I decided that if I got waved in I’d just ride on past. Riding on, the noise was still there and I now suspected a rear wheel bearing to be the problem. 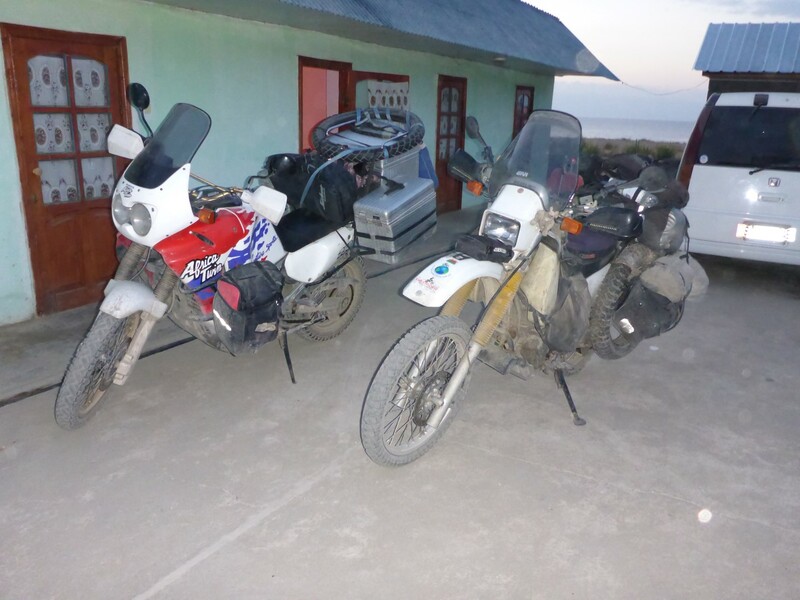 I headed to the nearest town and managed, with a bit of help, to find a hotel. This was another leisure complex and was appropriately priced but I was too tired and fed up to care. I ate some food in their café and retired for the night. My last thoughts were that it had been a great ride through the national park; that I was worried about the bike; **** the corrupt police. At about 2am I had to get up to ask a Russian couple from the next room to please stop holding their loud conversation right outside my window and to turn their music off. Anyone would think I was in a holiday camp! My decision now was to head back to Almati for repairs especially after checking my stock of spare parts only to discover I’d removed the spare wheel bearings to save weight and room. Bugger! It was just over 100km back to the city. Fortunately I’d taken one of the hostel’s cards so I had an address to head to. All I had to do was find it again. As I was riding the noises from the bike were getting worse, so bad in fact that I was beginning to wonder if it was the gearbox. The speed I rode at seemed to make no difference so I just got there as quickly as I could. Once in the city I just rode around, hoping to see something I recognised. After a while I stopped by the side of the road for a think and a local biker pulled up to see if he could help. I showed him the card and, with a bit of consultation from a friend on the other end of the phone, led me right to the place. Fantastic! 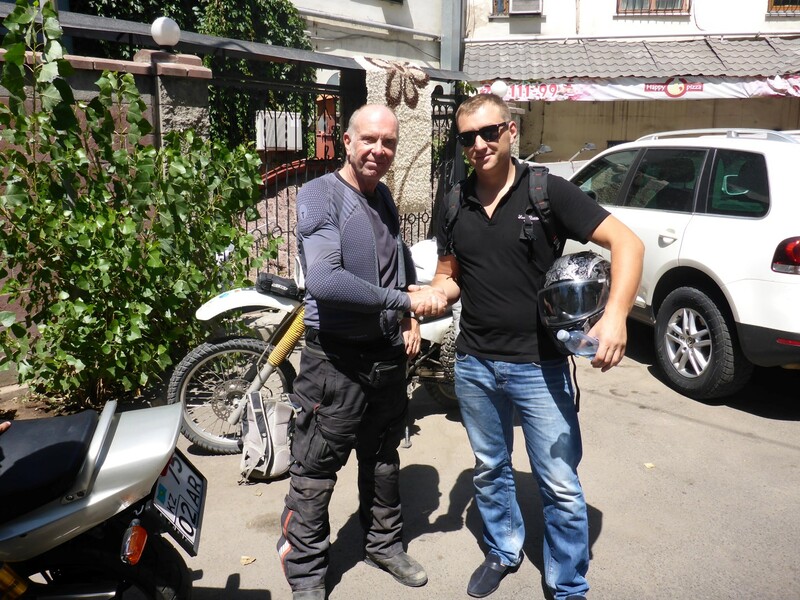 Yet more biker/Kazakh friendliness. I couldn’t thank him enough for saving me endless time riding around a busy city on a stinking hot day. Alex gave me his business card In case I might need any more help and, ironically, he works for a bearing supplier! Another biker saviour, Alex, who led me back to the hostel. The hostel people were surprised to see me, to put it mildly. But I got my gear back into the dorm, had a cup of tea and set off for Freerider Motorcycle Salon once more. It being Friday I wasn’t sure how much they’d be able to do at short notice, but as soon as I got there Yanna, the lady I’d met last time, organised a mechanic to check the bike over. He confirmed my own diagnosis of a rear wheel bearing. They said they should be able to match up the old bearing down at the Bearing Market the next day. Now this was one of those slightly surreal moments. Somewhere in Almati there is a market with stalls that sell all sorts of different bearings. And it’s open on a Saturday. And they were pretty sure they’d be able to get what they needed. Just imagine that happening anywhere in the UK. I was impressed. Is it an open air market or indoor? I don’t know and I didn’t ask. I can assure you I didn’t care. Doris, bum in the air. So once again they found me some workshop space, lifted Doris’s back end up in the air and I set to removing the wheel. When I got it off all that remained of the bearing was the inner and outer bearing race and three crushed ball bearings. I think I only just made it back. A long, hot walk back to the hostel, in my bike boots and heavy riding trousers, just about finished me off for the day and an early night beckoned. My previous joking partner, French Jimmy, had left so I had to put up with Nurlan telling me wonderful Hondas are and maybe I should have bought one of those. Oh how I laughed! I went back to the bike shop at about 13.30 next day and found the wheel fully sorted with three new bearings fitted and ready for me to install. What great service and all for T8,000. That was T6,000 for the bearings and T2,000 for fitting them (£20 and £6.60 respectively). I paid more than that for just the bearings back in the UK. I was delighted and was happy to tell Yanna as much when I chatted to her before I left. Having done another few jobs on Doris I headed back to the hostel. The ever so helpful mechanics at Freerider. Probably pleased to see the back of me at last. I was pleased to see a reply from Hera. I’d messaged her via her website and she told me they’d got to the canyon and had spent some time trying to find me. They were now in Kyrgyzstan and heading for a Yurt camp at a village called Torsor. That was fantastic news. I immediately changed my plans and said I’d see them there next day. At least this time I had a definite place at which to meet them. All that remained for me to do was to tell Nurlan he could shove his Hondas were the sun doesn’t shine, I had a Suzuki I was delighted with. Oh how we laughed. Seriously, they’re great people and it was good to see them all again. Up and about early with some serious distance to cover and an important rendezvous to make. I wasn’t going to mess it up this time. My route took me back towards the Charinski Canyon and this time I found it. It is, indeed, a beautiful place and I took some photos just to remind me of what I’d missed. 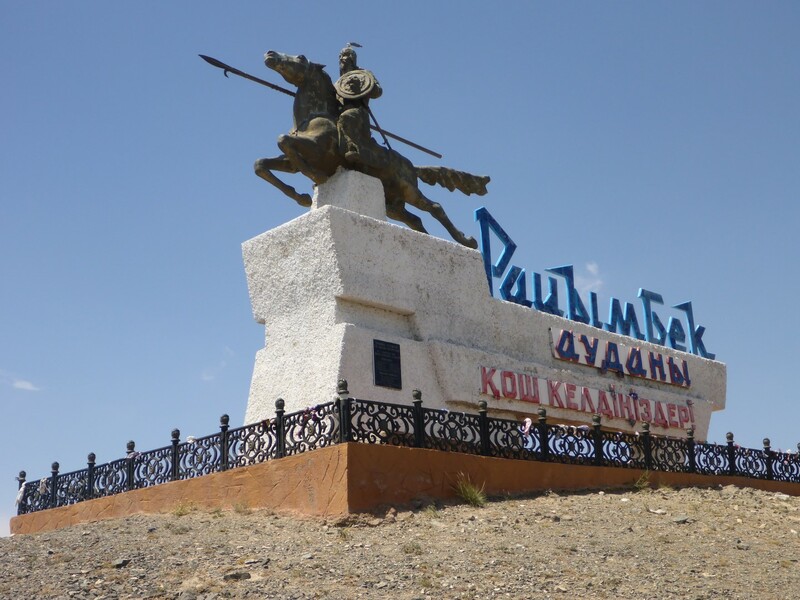 But, by way of consolation, had I found it last time I wouldn’t now be making and impromptu journey to Kyrgyzstan, a country I hadn’t planned to visit for some time. Life’s funny at times. The Charinski Canyon. Would have been a great place to camp. I was headed for the town of Kegan, near the border, and enjoyed a very nice ride through ever more mountainous country. I failed to check my map when I should have and didn’t turn right in Kegan. 30kms later I realised I was heading for the border with China, not Kyrgyzstan. Easy mistake to make really. When I finally reached the right border I almost wished I had gone to China. I got into difficulties there, entirely of my own making I should add. At the time I applied for my Kazakh visa there were a number of restrictions in place. I had to apply in my country of residence. I had to specify the date of entry, from when the thirty one day visa period would start. When I entered the country I had to register with the immigration police within five days. The first two restrictions were overcome, with massive help from Base Camp. I received my Irish passport while I was in Berlin so I sent my UK passport back to the visa company in London. Base camp then sent it back to me in Riga. All good so far. I just needed to make sure I got there with enough time to see the country before the thirty one days expired. This situation caused me to spend less time in Europe than I might otherwise have done. In particular I had to turn down an invitation to go away for a weekend with my kind hosts in Estonia, Kalle and Janc. As it was I had used up eleven of the thirty one days by the time I entered the country. So when I arrived in Kazakhstan the last thing on my mind was to find an immigration police office and register my presence. This almost led to me not being able to leave. I arrived at the border post, out at the end of 20kms of dirt road. I got through passport control and customs with no problems but then I came to the final passport check. And there I stayed. The passport control officer wanted to know where my registration document was. I pleaded ignorance. He was insistent. A woman there who spoke some English translated my responses, with me telling him that I wasn’t aware I had to register and that I’d stayed in several hotels who hadn’t mentioned it either (this was a reference to the fact that many hotels in Russia will undertake the similar registration process for you). He showed me the instruction on the back of my entry form, in English, telling me I had to register. I said nothing. Another guy there told me he’d seen people sent back to the nearest town to register before being allowed to leave. The passport officer left me waiting while he dealt with everybody else who came through. He left his office a couple of times for cigarette breaks, completely ignoring me. He made a couple of phone calls, maybe about me, maybe not. Eventually, after an hour and a half, he stamped me out and let me go. I was relieved, to put it mildly. He could have totally ruined my plans by sending me back to Kegan to register so I was grateful, if grudgingly so. 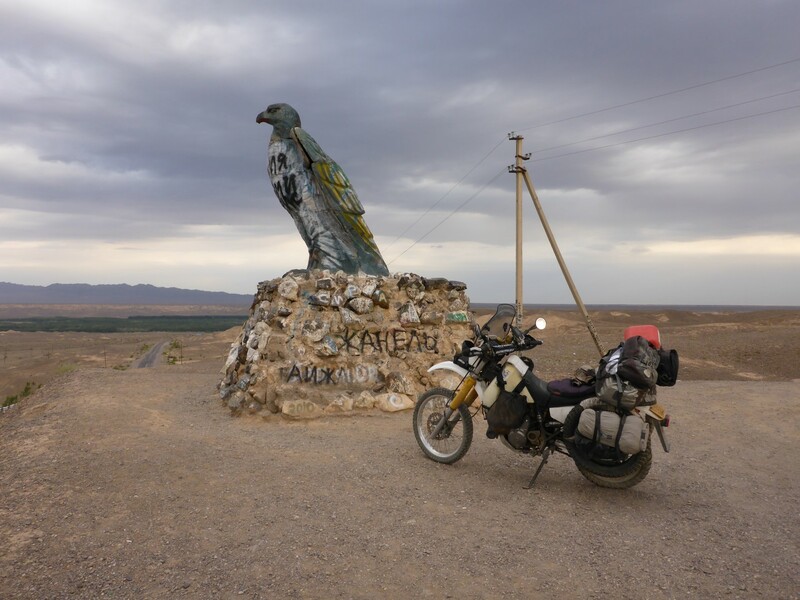 It was 17.30 by the time I got through the thankfully easy process of getting into Kyrgyzstan and I still had over 150kms to cover so I wound it on as much as I dared. The stony track eventually turned to asphalt and I made good time, getting to the village of Torsor just before dark. I found the Yurt camp easily enough but Hera and Racom weren’t there! They’d left me a note though and I found the guesthouse they were at easily enough. As I pulled into the yard they rushed out to greet me like long lost friends. 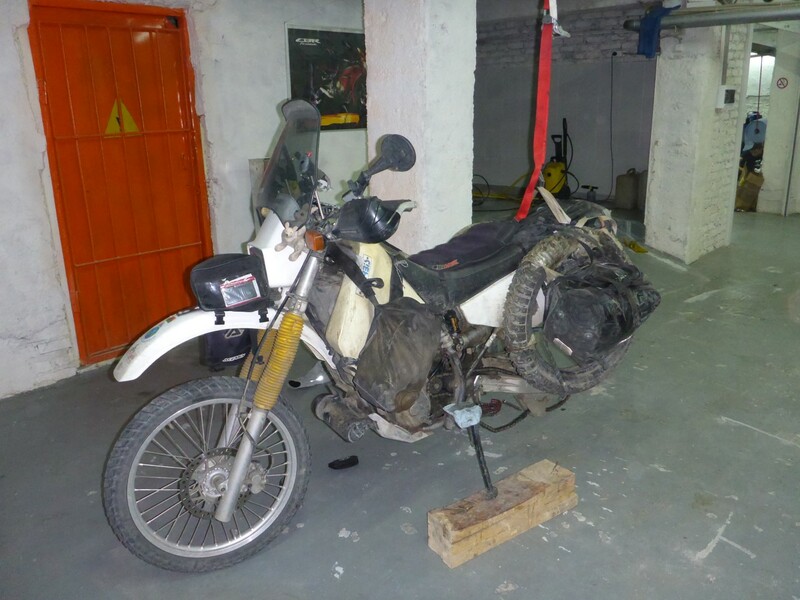 There, along with them was a Danish biker, Michael, who rode a Honda Africa Twin. So I ordered some food and the four of us had a great evening telling travellers’ tales past and present. It had been a long day, but I’d finally made it. A fine pair of steeds. Good heavens! This one reads like a thriller! Isn’t it great that you keep meeting delightfully helpful people – quite heart-warming. Hi David. Yes, It’s definitely the people I meet that make the journey so good. So much help and so freely given. Even the baddies give something positive to the experience. Hi Tony, great to hear from you. I’m really enjoying myself, probably even more than I expected to. Do I miss England? Not much, only my family and friends. I’m now in Mongolia, as you probably know from Facebook. It’s just a shame that my writing is so far behind riding, but I’ll catch up one day. Take care of yourself and give my love to Amanda.